Toronto Dogs Directory: "Rescue" Lies About Dogs Being Emotional Support Animals To Import And "Adopt" Them - DISGUSTING! "Rescue" Lies About Dogs Being Emotional Support Animals To Import And "Adopt" Them - DISGUSTING! Off the bat I will tell you that over the years I've seen some extremely questionable behaviour on the part of animal, "rescues" that are nothing but puppy brokers and dog shufflers for profit. It is called, "retail rescue" and it is a disgusting yet extremely profitable endeavor. What I have never seen however, is a rescue lying about transporting, "Emotional Support Animals" (ESA) when nothing could be further from the truth. 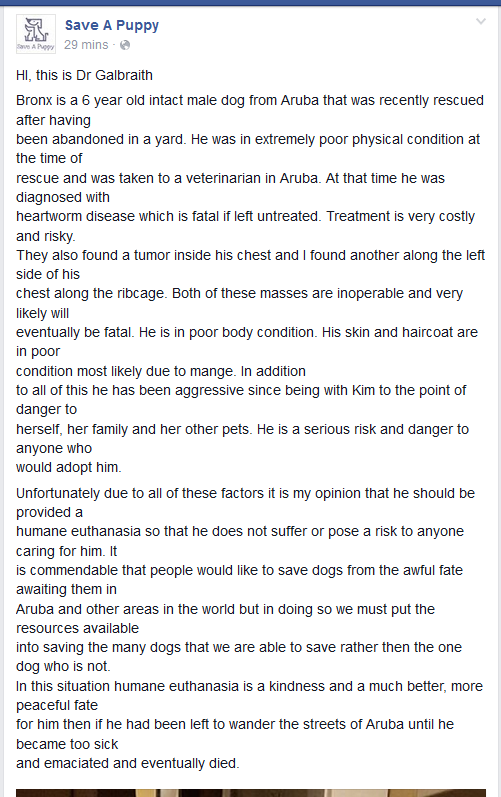 Since September it appears the at least one airline, American Airlines, has refused to allow Save A Puppy to travel from Aruba with any dogs, and with good reason. Who could blame them after the last debacle? Save A Puppy responded by publicly admonishing the airline. This week in a lengthy post, Save A Puppy publicly criticized two more airlines (while refusing to mention them by name) for putting its dog traffickers through intense scrutiny. Save A Puppy has claimed that at least 6 of the dogs it has imported are ESA needed for emotional support for the individuals trafficking them. Save A Puppy simply went online and paid a fee to register the dogs as such and receive a certificate. It is nothing but lies by this retail rescue. 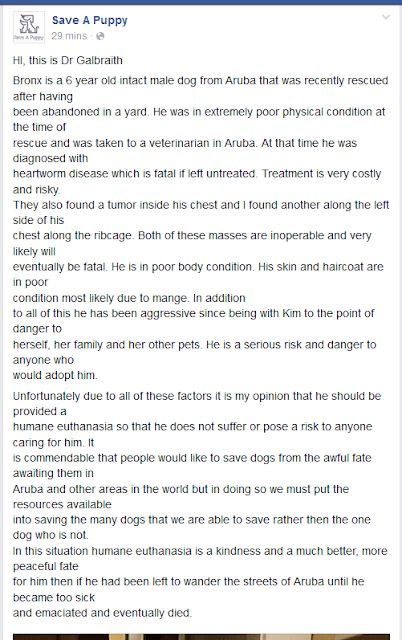 First off, while Save A Puppy remains adamant the dogs are ESA needed to assist the transporters through the difficulty and stress of airline travel, it appears this is only the case when these dogs are travelling from Aruba to the U.S. or Canada. As for all those flights TO Aruba to pick up dogs to import here? You guessed it, no ESA needed. One has to wonder, if Bronx is such a tremendous ESA, why has Save A Puppy publicly posted a letter from its own vet that states Bronx has shown signs of aggression!! As for all the other animals Save A Puppy has claimed are ESA? They have been or will be, "adopted", for a fee of course. I can think of fewer things more repugnant than what Save A Puppy is doing. Perhaps the people at Save A Puppy do have mental health issues, but how dare they make that claim while they insult not only individuals who GENUINELY need the assistance of these animals, but the true ESA who are every day heroes. I'd like to say it will be some time before I see a "rescue" exhibit such unconscionable behaviour but when there are so many retail rescues out there trying to make a buck, it will not surprise me. I definitely won't be surprised if the "rescue" in question is Save A Puppy.